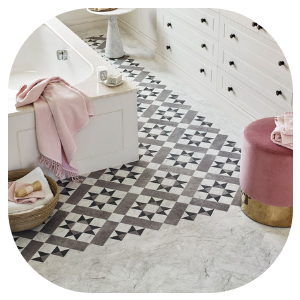 Choosing beautiful flooring that's hard-wearing, practical and moisture resistant can be a difficult task, but with Luxury Vinyl Tiles the search is over. Whether you're re-designing a small bathroom or renovating an office space, luxury vinyl is designed for all interiors in both residential and commercial properties. At Bramley Carpets we pride ourselves on being official retail partners with leading manufacturers such as Amtico, Karndean and Moduleo who have chosen ourselves to market their products due to continued excellent customer service and professionalism. Our Heaton Moor and Newbridge Lane showrooms both have extensive ranges of products available so feel free to stop by and see them for yourself. Moisture Resistant- Unlike wood based floor-coverings that are easily susceptible to water damage, luxury vinyl tiles are made from PVC so are fully moisture resistant making them perfect for use as Kitchen and Bathroom Floors. Lifespan- Manufactured from robust materials, LVT is built to last and all of our vinyl tile products are backed by official manufacturers warranties ranging from 12 years to Lifetime Guarantees. Warmth- Ceramic Tiles and Solid Wood Floors can feel cold and hard underfoot, however Luxury Vinyl Flooring provides warmth whilst the additional thickness of the tiles gives a more comfortable feeling. Slip Resistance- Many of our LVT floors are manufactured with an R-10 slip rating giving additional protection when walked upon. Maintenance- Due to Vinyl Floors being moisture resistant, the cleaning process is simply a suitable cleaning solution, warm water and a mop and bucket. Innovative Designs- Our partners are always producing cutting edge designs from Wood and Stone Effects to the modern Abstract Designs in various colours and textures. LVT can also be installed with additional feature strips to create a designer ship-deck floor or a traditional block tile effect.